You are here: Home / Healthy Diet / Health Supplements, Vitamins & Minerals / Does Lysine Prevent Cold Sores? Cold sores, or so-called painful blisters, can occur anywhere on your body. Your lips and mouth are the most commonplace. You can find them on your fingers, cheeks or nose. Regardless of the name, they are caused by the herpes simplex virus (HSV), not by a cold. This kind of infection is common amongst people with immunity or health problems, or you can blame the genetics. These painful lesions are filled with fluid, and they can be very painful. HSV can be transmitted by getting in contact with the person who has the virus. When you’re infected, the virus becomes active after short periods of time, and it will stay in your body forever. It travels from your nerve cells to the surface and multiplies. That way, it can cause an outbreak on your skin. Triggers for the outbreak can be stress, cold, menstruation, certain foods or allergies. After the sores form, they can break or ooze. When the crust or scab falls off, your new skin will reveal underneath them. However, this infection has its own treatment. There are several products and remedies you can use. One of them is lysine. The most common product is lysine pills for cold sores, but it also comes in the form of liquids and creams. L-Lysine is an amino acid and one of the ‘’building blocks of protein’’. It helps with numerous functions in our body. 20 amino acids are necessary for proper internal health and protein creation. Only 10 of them can be created by the body, which means that the other 10 must be consumed. The importance of amino acids is affected, especially if you don’t want to have a degradation of internal cells. There are D- and L- forms of amino acids. L- forms are for protein synthesis, and they must be consumed from food or supplements. L-lysine has a plethora of benefits, but people often use it as a treatment for cold sores. You can take it orally or consume it through food. Meat, beans, cheeses, and eggs contain a significant amount of L-lysine. Lysine was used as a treatment and supplement for managing the virus since the 1980s. However, several types of research show no improvement of cold sores, while others suggest that it can help prevent outbreaks. Therefore, if you choose to try this method, we recommend that you consult your doctor. Cold sores can last from 7 to 10 days. If you’re not careful, you can efficiently transmit the virus to persons around you. Thus, how fast does L-lysine work on cold sores? Unfortunately, there are no many studies on this subject so that we can claim for sure about the healing process duration. The research published by Dermatologica shows its efficiency as a therapy for herpes simplex infection. Additionally, It can be used as a prevention remedy for cold sores. In the study published in the International Journal of molecular medicine, it has been shown that arginine inactivates the herpes virus and increases the replication rate of cells. Lysine works against it. It slows down the activity of arginine. Hence, it may prevent the appearance of cold sores. Many doctors answered the following question to speed up the healing process: What not to eat when you have a cold sore? They recommend cutting out nuts, seeds, spirulina, chocolate, squash, oats, and wheat. However, the research published by BMC Veterinary Research shows that a lysine supplement is not effective for the prevention of herpes virus whatsoever. When it comes to combining lysine and the cold sore treatment, reviews are: many individuals who use this type of remedy to treat cold sores say that it’s an effective method. L-lysine may help with reducing the number of outbreaks, and it might aid in lessening the frequency of them. L-lysine might reduce genital herpes, but there aren’t enough studies on that subject to claim that for sure. 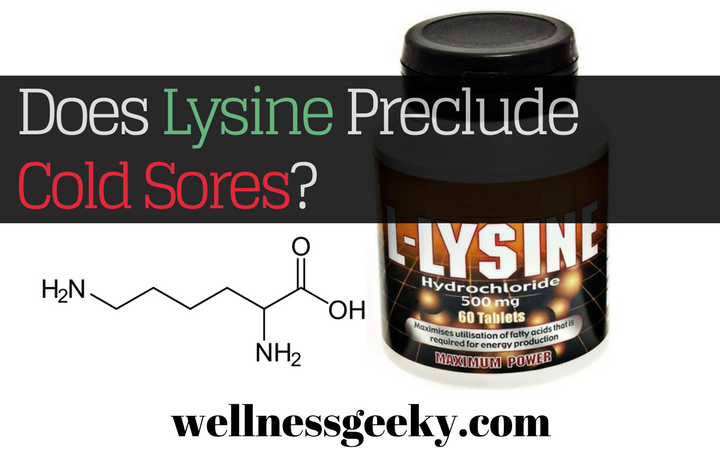 Additionally, if you’re not comfortable with pills, you can try lysine cream for cold sores. Usually, people have the following debate: Lysine cold sore treatment vs. Abreva Cold Sore Cream. Abreva contains the chemical called Docosanol, and it says that it’s able to cure a cold sore in just 2-3 days. This cream penetrates into the skin and blocks the virus. According to the reviews of the users, Abreva works effectively. We suggest you to choose one option, consult with a doctor and try with it. Collagen is one of the most integral proteins in our body. It contains the amino acid L-lysine, along with proline and glycine. Lysine contains molecules that have a wide range of benefits for your skin and overall health, such as firm and healthy structure. That is one of the reasons why it’s one of the first choices when it comes to therapy for acne patients. This amino acid plays a role in promoting a healthy immune system. You might want to consider adding amino acid supplements and skin care products to your daily routine. Individuals that don’t get enough amounts of lysine, or have lysine deficiency, are prone to acne. Lysine can be used as an anti-aging component. Wrinkles and sagging skin start to appear when collagen breaks down. By providing enough collagen to your skin, amino acids help to rejuvenate the skin, and they restore smoother complexion. One of the proteins that our hair contains is keratin. It may be one of the essential proteins due to its role in synthesis. Amino acids in it (lysine, cysteine, arginine, and methionine) prevent excessive hair loss and promote hair growth. Lysine can accelerate bone recovery by increasing the amount of collagen. It enhances the blood circulation and helps to prevent osteoporosis in a natural way. Scientists at Florida State University studied how lysine conjugates affect damaged strands found in cancer. It can locate a damaged strand and spot. Afterward, it tears apart the rest of the strand. This capacity of lysine can be activated only when it’s exposed to certain types of light. Therefore, it can destroy 25-90% of cancer cells. To minimize stress and anxiety, try incorporating more foods that are rich in L-lysine in your diet, along with magnesium, omega 3 and B vitamins. It can help you absorb calcium, which can also reduce symptoms of anxiety. The study by Biomedical research in Tokyo, Japan found L-lysine helpful for stress reduction. In addition to that, it can decrease the effects of schizophrenia caused by anxiety. However, if you’re not careful with the dosage, you might experience some of the side effects: nausea, diarrhea or abdominal pain. Amino acids are becoming more and more useful for treating numerous conditions and preventing diseases. As we said previously, L-lysine may be the essential amino acid. If you want to make sure that you consume the right amount of it, increase your intake of beef, fish, seeds, eggs, and soy. If you’re thinking about getting a lysine supplement, be careful with the dosage. Nonetheless, how much lysine is too much? If you’re not sure about the dosage of the outbreak, consult with your doctor. By adding skin care products that are based on amino acids, you might prevent the appearance of acne or signs of skin aging. They may help you achieve younger-looking skin and overall smoothness, without the appearing of uneven skin tone.